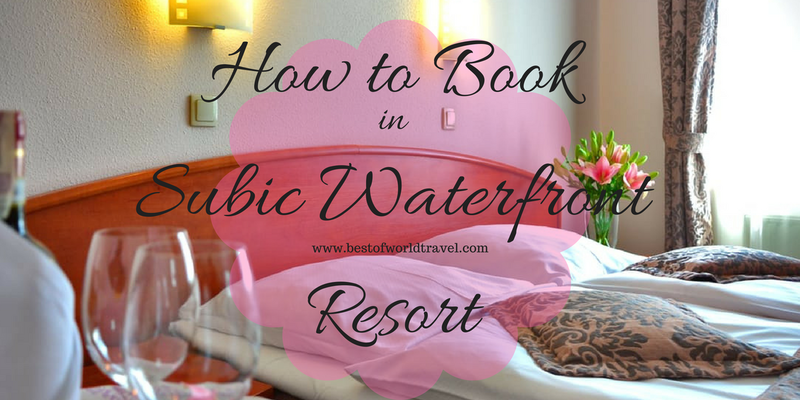 How to Book in Subic Waterfront Resort and Hotel then Earn Reward Points? Subic Waterfront Resort and Hotel is one of the most popular hotel and resort in Olongapo also in the whole Zambales. It is located near the Baloy Long Beach, a very fine beach where foreigners tend to visit at summer seasons. For starters, you can ride a tricycle to go to the beach proper or just walk it off to experience the atmosphere of the Zambaleneos. But be aware that you might need to pay a couple of bucks for the Baloy beach entrance fee. The resort is also a few minutes away from a fresh flea market, a convenience store, a bank, a hospital and a colorful nightlife. Why Book in Subic Waterfront Resort and Hotel? The Subic Waterfront has earned the reputation of being one of the best hotels in a budget in the whole Zambales. You can not just save a few bucks , but you’ll also experience the best among the rest. If you’re wondering on what are the “reward points” that was stated on the title, then it’s all about an online booking where you earn points that can give you discounts or even a free hotel stay in the near future. It is like you’re earning a “mileage points” when you fly in a certain airline. Or earn a few Mall points to get freebies. Featuring the TravelBook PH, you can now book at a very low cost while earning certain reward points. For example, the Premiere Suite of the Subic Waterfront Hotel is around 1571 PHP or $32 USD (20% discounted). A free breakfast is already inclusive for two. Aside from getting a massive 20% discount, you will also get a TravelBook PH hotel rewards which are 352 points. These points can be used in the near future if you will plan on booking again in the same hotel or any hotels in the Philippines, as long as TravelBook PH is affiliated in their company. Subic Waterfront also offer an online booking based in their website. You can visit it here. 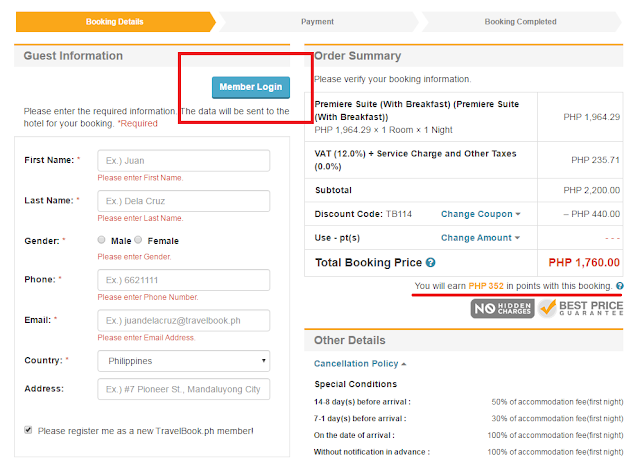 By navigating in their own website, you can now compare which rooms are offered better compared to the TravelBook PH. If you have decided to continue booking in TravelBook PH because of a lower rates, or because of the reward points, then this article will continue for you. You don’t need to search the “Subic Waterfront Hotel”, because just by clicking the button below, you are automatically redirected on the page where you can view their discounted rates. 2. Find your desired room/s according to your preferences. Just like other online hotel booking websites, TravelBook also shows certain reviews of the past customers, not just from TripAdvisor, but also from TravelBook users. The beautiful hotel has a rating of 3.9 stars from TravelBook users and 3.0 stars from TripAdvisor. If the beauty and reviews have captivated your own eyes and heart, then it’s the time to continue booking. If you have an existing account in TravelBook, then you can log in so that the fields will be automatically filled up. Always check the date of your booking, your name and other important details. Put on your discount coupon (if you have) and proceed in choosing what mode of payment will you use. Unfortunately, as of March 2017, Subic Waterfront does not accept pay-at-the-hotel mode of payment. One of the most convenient mode of payment using the TravelBook App/Website is by booking online, and pay at the hotel. But unfortunately, Subic Waterfront Resort does not accept this mode of payment as of now. So this choice is already crossed out. But don’t worry, because the next choices are also hassle-free. Just a full load of choice where you can easily pay up after booking. As of now, the TravelBook PH only accept credit or debit cards with a VISA marks. Mastercard or Bacnet card holders are not allowed. 7/11 are one of the most popular convenience store in the Philippines, and yes you can actually pay up here. But the problem lies on their system. Sometimes when paying up in 7/11 their systems are slow or off-line. If this happens to you, then you have to resort on other choices like going to the nearest LBC branch and pay up using the Bayad Center. Just a few minutes away from Baloy long beach and Treasure Island Subic. You will find the hotel just also near the national high way. Subic Waterfront Resorts and Hotel is a budget hotel that can be found just near the all popular Baloy Long Beach of Olongapo. If you will check other Baloy Beach resort rates, you will find that the Subic WF is really a high-class resort but budget friendly. With the their partnership with TravelBook PH, customers can now easily book online and earn reward points that can be used in the future for discounts or even avail a free hotel stay.